Join us for this groundbreaking course. This course will not be recorded or broadcast to encourage a free flow of ideas and expression. Buy your tickets for Saturday 19 October here. Buy your tickets for Sunday 20 October here. Following the success of last year’s course, IHRC is delighted to be holding more Decolonising the Mind courses led by Sandew Hira from the International Institute for Scientific Research in the Netherlands. Hira is a leading critic of the new colonial discourse and the legacy of colonialism. Download the poster and a more detailed flyer at the end of the page. The legacy of colonialism is an open wound in present-day western society that has different names: racism, Islamophobia, white supremacy, extreme right etc. Despite the gains won by decolonisation in the sphere of politics, economics and international relations there is still one dimension of colonialism that has survived the process of decolonization in the fifties and sixties of the last century, that is the dimension of mental colonialism. Mental colonialism created a narrative of race relations that still dominates the discourse in western media: the supposed superiority of western culture and the supposed inferiority of non-western cultures. This narrative has changed in the course of four centuries of colonialism, but is its basic assumptions are widespread in the educational system and the discourse in the media. It is there in the mind of both the former coloniser and the colonised. 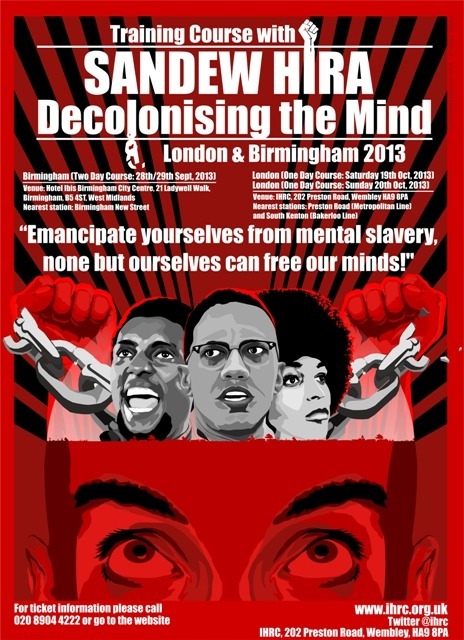 Decolonising the mind means changing the mindset of both groups. 1. Knowledge dissemination: To present new decolonised knowledge on colonialism and its legacy. The student gets an integrated view on five dimensions of colonialism: geographical, economic, political, social and mental. The student gets to know the dominant propositions by scholars from the current of scientific colonialism and their arguments. The critique of these propositions and arguments are presented from the point of view of DTM and an alternative framework is presented to understand the legacy of colonialism in present day society. 2. Developing an assertive decolonial attitude. DTM is not only a matter of consuming new knowledge. It is an attitude that is firmly grounded in the belief that the dominant authority of knowledge (science, government, education, and media) and its policy implications can and should be challenged with sound counterpropositions and arguments. The course aims to build such an attitude. 3. Mastering the tools of debate and discussion for DTM. Knowledge and attitude might not be enough to decolonize the mind. The main instruments of DTM are discussions and debates. The course trains student in discussion and debate both in term of content as well as form, presentation and attitude. DTM is a struggle. Training in discussion and debate is training in the art of intellectual struggle. Nearest stations: Preston Road (Metropolitan Line), 1 minute walk and South Kenton (Bakerloo Line and London Overground) 12 – 15 minutes walk. The cost of the course is £23 (full rate) and £18 (concessions). Buy your ticket by clicking here or here or you can call us on 020 8904 4222. The concessionary rate is available to OAP’s, Students, the unwaged and regular IHRC supporters. You will be automatically registered once you pay for your ticket. You can contact the DTM co-ordinator by emailing events[AT]ihrc.org or calling 020 8904 4222. Further information, including course content, will be posted on this page and sent to everyone who has registered.